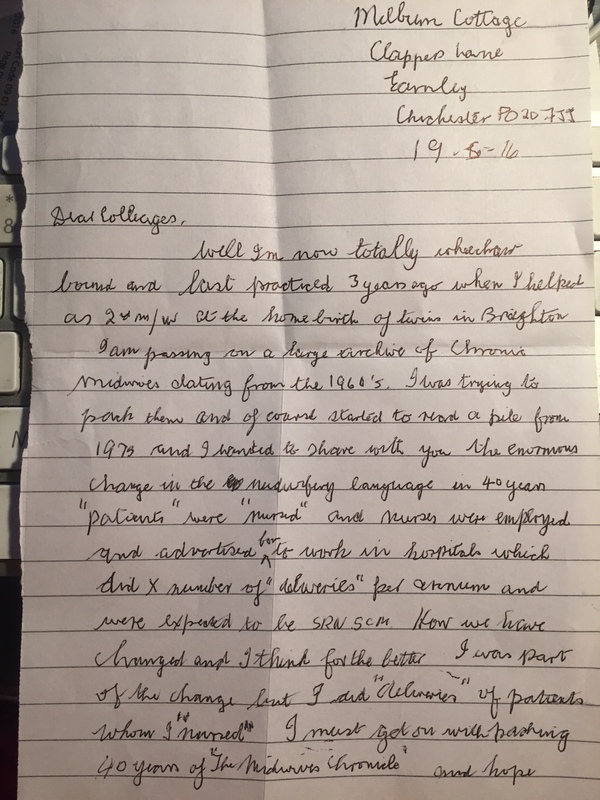 Mary Cronk: Language – how far have we come? 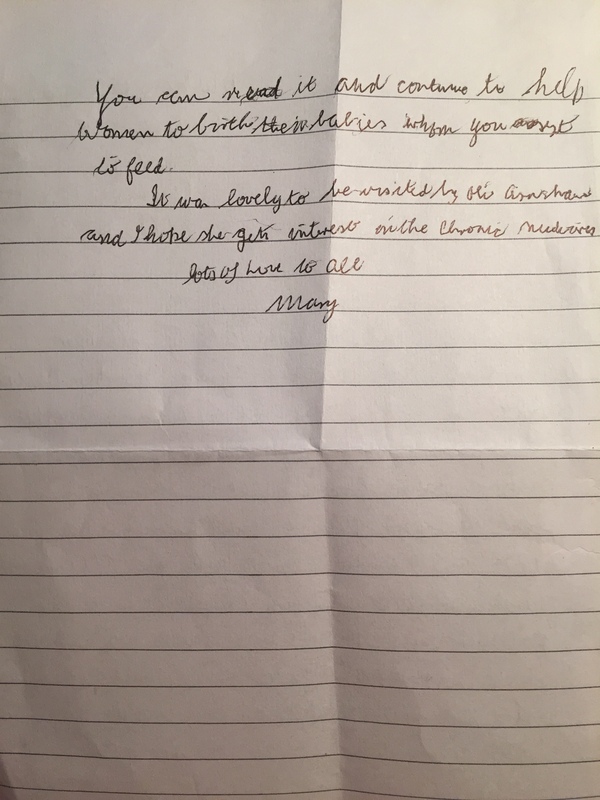 Mary sent this letter today, asking me to ‘put it on a universal email on the computer’ for her sisters in midwifery to read. So..
Well I’m now totally wheelchair bound and last practiced 3 years ago when I helped as second midwife at the homebirth of twins in Brighton. I am passing on a large archive of Midwives Chronicles dating from the 1960s. I was trying to pack them and of course started to read a pile from 1973 and I wanted to share with you the enormous change in the midwifery language in 40 years. “Patients” were “nursed” and nurses were employed and advertised for to work in hospitals which did a number of “deliveries” per annum and were expected to be SRN/SCM. How we have changed, and I think for the better! I was part of the change but did “deliveries” of “patients” whom I “nursed”. I must get on with reading 40 years of Midwives Chronicles and hope you can read [them] and continue to help women to birth their babies, and not “deliver” them. In preparation for moving house, Mary has cleared out – and given me – Midwives Chronicles and other magazines, going back 40 years. I’m enjoying perusing them, especially the antiquated job adverts, and wondering how best to put this classic resource to use – any suggestions? Mary is passionate about using non-medicalised, woman-centred language that emphasizes caring and respect. Although we have surely come a long way since confinement for childbirth, and referring to patients, we still have some more evolving to do towards the personal empowerment of birthing women: Delivery remains the ubiquitous term in maternity for birth as babies are “delivered” by the provider, not “borne” by the mother. Failure to progress is also woefully current – “disempowering and pejorative words that emphasize the poor quality of the uterine “machine”, women’s inability to give birth” (Hunter, 2006). Mary has always been adamant that women do not go wrong, or fail (see this 45s video from 2012) – just that we may need some help sometimes, and there’s nothing wrong with needing help. She feels sad that as women we immediately blame ourselves when labour doesn’t happen the way we’d wanted, we say of our birthing bodies: “I wanted a normal birth, but I did it wrong”; “it went wrong”; “my body wouldn’t../couldn’t…” and so on. Much has been written about the language of childbirth (Bastian, 1992; Byrom, 2013; Hewison, 1993; Hunter, 2006; Kahn, 1998; Wagner, 2001; Wickham, 2002; Zeidenstein, 1998) and how it may contribute to these feelings of inadequacy, deficiency and humiliation. While old habits may be slow to shake off, language is everyone’s responsibility, something we all use – and it matters. Let’s be mindful of the impact of the words we choose, when talking to, or about, the women in our care. Please, please, please can we get this stuff onto Internet access if Mary would agree. God knows, I could do with her words of wisdom and experience in my ears. This is awesome, women have their own templates for labour, not prescribed by medicalised text, thanks Mary your work is a valuable asset for the future of midwifery. This is superb! Thanks for sharing. It might be worth taking Mary’s address off the letter if you share more widely though. How about contacting De Partu. Mary’s archive of journals and documents are an important part of our midwifery history. I have had the privilege of hearing Mary speak several times. She has been my role model and her love and respect for women has guided my own practice over the years. Thank you for all your wisdom and willingness to share it to enable us to grow as responsive midwives.